Certainly there are valid reasons for this–export of Japanese naval designs was an impossibility until very recently. 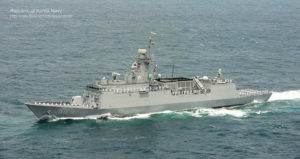 South Korea is only emerging on the scene now, and their Navy’s Incheon-class frigates are gaining some attention. But, still, despite some successes and a generally positive international reception to new ships, Asian ship design seems to be under-represented given the extensive build-up and modernization of the forces in the area. Why? And could the West be missing some creative design solutions from regional players in these areas? Even China, though that country is only on it’s first iteration of indigenously-designed export-quality ships, is beating Japan and South Korea in the naval architecture export game as well, with Type 039/041 designs going to Thailand and Pakistan. Shipbuilding is an international endeavor, and the long-term and extensive collaboration between American shipyards and foreign partners isn’t fully appreciated by even the staunchest “MAKE AMERICA GREAT AGAIN” booster. I worked for an Australian shipbuilding company in Alabama; last weekend I was on an Italian warship and ran into the prospective Italian builder’s U.S. CEO just off Times Square. Shipbuilding design is a great melting pot of ideas. But Japanese and South Korean ideas don’t seem to penetrating naval shipbuilding as much as European designs are. It boggles the mind, sometimes. Take the U.S. naval shipbuilding giant, NASSCO. Since 2006 they’ve been building designs from DSEC, a wholly-owned subsidiary of South Korean shipbuilding giant Daewoo. Since then, the Daewoo Ship Engineering Company (DSEC) provided detail designs and enough construction/shipbuilding services to make even the most hardened Jones Act supporter blush. But South Korean designs are in such extensive use at NASSCO, it seems, sometimes, to pretty much be a South Korean yard. The NASSCO/DSEC build-book is big: 5 PC-1 tankers, 2 LNG powered Marlin-class Containerships, 8 ECO-class tankers of varying flavors, and, most recently, two Matson Kanaloa-class ConRos. That’s a lot of work. DSEC has brought a lot of innovation to NASSCO–introducing LNG-ready designs and efficient, optimized hull-forms. The improvement in hull design has been constant and measurable; the modern DSEC ECO-class tanker design offers a 33 percent boost in efficiency that cuts “fuel consumption by the equivalent of about 10 tons of fuel per ship per day” over the original five PC-1 “State-class” tankers. Aside from detail design, NASSCO adopted a number of South Korean tips to boost the yard’s productivity, making processes more efficient and adding more utilizable facilities on the yard as well. Now….One might expect that all this shipbuilding goodness would–at a design level–flow right into American naval platforms. But no! NASSCO’s Expeditionary Transfer Dock and Expeditionary Sea Bases are using NASSCO’s Alaska-class oil tankers–the last U.S.-designed merchant ship NASSCO has ever made–as a template. The design dates back to the ’90s. From a macro level, none of that South Korean design goodness–more efficient hullforms, powerplant design or other obvious HME features–made it into the T-ESD/T-ESB design. Why? Why is the Navy tolerating designs that are, in essence, twenty years old? What’s wrong with the South Korean designs NASSCO’s been building for decades? There is likely a lot of goodness in Asian shipbuilding designs that America–and maybe the rest of the West–aren’t exploiting. Now, there may be strong cultural reasons or solid design sensibilities (i.e the common trope that South Koreans only design ships to last 10-20 years! Egad!) that makes naval design/build collaborations difficult, but there’s no way the massive investment in native-design ships in Japan and South Korea aren’t paving some useful new ground in naval architecture. Mutual U.S. engagement with Japan and South Korean ship designers might be useful for all parties. There are quite a few avenues available at the moment; America is, right now, gearing up to rebuild the strategic sealift fleet, and that effort may be an interesting means to on-ramp the latest in merchant ship technology. 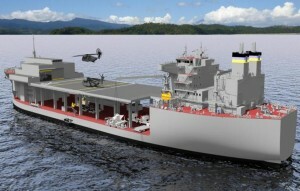 The Common Hull Multi-mission Platform (CHAMP) and the MARAD training ship designs are just beginning to be formed, and this might be a good opportunity for the community to tap Asian know-how, and to have a long-overdue discussion on things like the long-term naval viability of things like, oh, the soon-to-be-ubiquitous LNG propulsion systems, electric ships and optionally-crewed merchant-ship control systems. Or MSC and MARAD can quietly accept the decades-old merchant ship designs that U.S. designers have in the books and be content operating vessels that are, in essence, obsolete from launch. Undersea technology is another area of potential collaboration. Japan’s undersea capabilities are highly-regarded and the flurry of new companies focusing on naval opportunities for unmanned undersea vessels offers a likely interesting opportunity for Asian technology. At the base of it all, ship design is really important. Naval designs (and, well, let’s face it, smuggling designs) are often the engines that fuel maritime innovation. I’m a nationalist–I’d sure like to see more native American designs out there. But even if America’s Navy did fund regular naval design competitions to foster new innovation in landing craft, tugs, frigates and so forth, America isn’t generating enough naval architects to absorb even that modest challenge. So America’s Navy is–at least for the frigates, landing craft and other supporting platforms– dependent upon foreign design innovation. And while the vigorous international interchange of ideas makes any ship stronger, America’s growing dependence upon foreign designs is worth mulling. What happens when, say, a foreign designer is irked by trade perturbations or divergent policy outcomes? American shipbuilders–and American politicians–haven’t quite thought that through. But, hey, those are challenges for another day. Right now, collaboration is the only way to go, and, frankly, if that is the case, it might be smart to do more with our emerging Asian partners and Asian shipbuilding giants. In the asianfrigates™ there is significant amounts of European design language. DSME’s DW3000 and HHI HDF-3500 were helped by Saab and Kolkums, ST Marine( Singapore) LMV and Vanguard ™ series is again Kolkums and Saab. 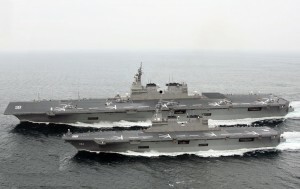 Japanese warships are practically American in arrangement. That being said we should of encouraged South Korea and Japan to submit bids. The Ashai class DD, one of the meanest looking ships afloat, which includesudes a CODLAG hits all the parameters of the FFG(X) and already uses derivative USN equipment. All that said I think we should really make a hard look at the Iver Huitfelt design and also be prepared to lift equipment off older ships as appropriate. Yeah–I hear you on the utility of the Stanflex design to keep older weapons in the fight more easily–on my part though, I’m particularly interested in knowing how NAVSEA would approach design changes within a module. I don’t want Stanflex to become just another easy argument to maintain old solutions. When I look at how much work (and money) that went into certifying the MK41, I just wonder how much cash and time NAVSEA and DOTE would demand before authorizing a new Stanflex-box missile launcher scheme or some other innovative Stanflex-enabled experiment. This reminds me of the US fashion industry… yes, perhaps an odd parallel but US schools stopped producing the technical graduates needed to make complex, innovative garments years ago (pattern makers, tailors, cutters, sewers etc). The flipside is our schools produce a surplus of US liberal arts graduates trained in design or business but entirely lacking in technical skills. Net result: walk the hallways in New York’s fashion district and all the technical work and innovation is done either by immigrants trained in Asia/Europe or outsourced entirely to workshops in Milan, Paris, Tokyo etc. There are dozens of Japanese for example doing critical irreplaceable jobs in New York – jobs where the worldwide talent pool is measured at best in hundreds. They get their training in their home countries, then US companies struggle to poach them. Hey, thanks for reading! That analogy really works! Shipbuilding is a little more complex than fashion, but the outsourcing of key trades is a “thing”. For me, what will be really interesting in the shipbuilding space will be to see how the emergent US-based set of essentially DIY inventors in the unmanned vessel space transform into manufacturers….As that sector matures it’ll be fascinating to see who stays domestic, who CAN stay and make a productive living in their communities, and how the manufacturing base settles out as things scale up. Previous post: Is HII’s “Missing” FFG(X) Using StanFlex? Is it a Type 31e?